Fancy a real whirlwind challenge? Take a brand new camera, a pretty model, a photographer, an assistant, a hair stylist, a make-up girl, an art director and a time-keeper. 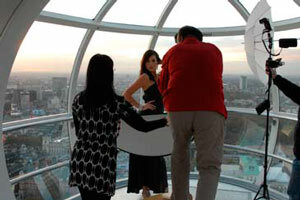 Put them all in a capsule of the London Eye and then get to the top and shoot a balanced light image of the model against the sunset over the city, shoot other poses, get a team shot and get packed away - all in one revolution of the Eye. Usair Kharawala aswpp tells us how he did it with minutes to spare, before bagging a more leisurely front cover on the way home - boom boom! This was one of the most exciting, challenging and adrenaline-charged shoots I've ever done. The idea came about during a conversation with Jakki at Nikon UK. My brief was to demonstrate the use of Nikon SB800 Speedlights' off-camera flash in a confined space and in a very limited period of time. Few venues came to mind, but the one which really stuck out was the British Airways' London Eye. The venue matched the criteria of the shoot perfectly and so the meticulous preparations started. The logistics of the shoot had to be worked out in the minutest detail and it took around six weeks of intense activity to pull it all together. There were strict guidelines from the London Eye, which we had to adhere to. For example, the model's clothing, the nature of the shoot was constrained; all equipment had to be portable as the Eye does not stop for boarding; all equipment had to be battery powered as there is no additional power supply, and nothing could be attached to the inside of the capsule itself. The capsule was finally booked and a team of eight was chosen. The planning of the shoot can be compared to a military operation but what made this shoot different (and, perhaps unique) was the fixed length of time in which we had to shoot and complete the brief. Once on board, the rotation of the capsule is 30 minutes, of which the first five minutes were allocated for setting up and the last five minutes were for packing up. This left us 20 minutes of actual shooting time, but we were conscious that the best shots would probably be whilst we were at the summit. This left us approximately 10 minutes from the time we boarded, to getting the images in the bag. Another huge factor to account for was the constantly changing direction of the sun as the flight progressed. We were extremely lucky to have a beautiful sunset and the view from the top was all the more breathtaking, but technically, we needed to keep a constant eye on the exposure. To keep the shoot more challenging we avoided rehearsals and dry runs; I wanted to demonstrate getting it right first time. I've never shot inside the capsule at the London Eye so it was pretty much going into the unknown. In these situations you need to have full confidence in your ability, your kit and the team you have around you. My biggest concern was dealing with the reflections from the glass, for which I had a plan A, plan B and plan C - pretty much every scenario! Using the Nikon Speedlights allows me to have a very portable and lightweight kit bag and we decided to take the train into London Euston, only to find out, the day before, that there was a railway strike. So, the first plan B came into action, and five of the team ended up together, driving into London. We used the hotel closest to the London Eye to allow the model to be styled, changed and ready for the shoot; then we were at the London Eye within a short two-minute walk. I had five poses in mind for the shoot, needing three standing and two sitting down. Our model, Katie, my assistant and I went through the planned poses and discussed the shoot. We checked in at the priority check-in desk at the Eye and our equipment was checked to make sure we had conformed with all the necessary regulations. Each member of the team had been previously briefed on their own specific duties and responsibilities, and as soon as we boarded the capsule, the action started. Nikki and Holly (the hair stylist and make-up artist) made sure that Katie was ready and quickly fixed Katie's hair following the November blast of wind we had all received! Sylvain, my assistant, was tasked with setting up two SB800s on a lightstand with a diffused umbrella; Farzana's role was to position the Lastolite reflector for each shot. Our official time-keeper was Henry, who was instructed to call time at fiveminute intervals. Jakki, of Nikon UK, was overseeing the whole shoot and taking pictures of all us at work. I got the D3 and the SU800 commander unit ready to shoot.